The Canadiana Centrepiece draws from the rich traditions of the holidays and our natural heritage. Fresh green and fragrant foliage including B.C. cedar, fir, Ontario pine are complimented by colourful pinecones and berries. This is the ideal accent for your festive table. 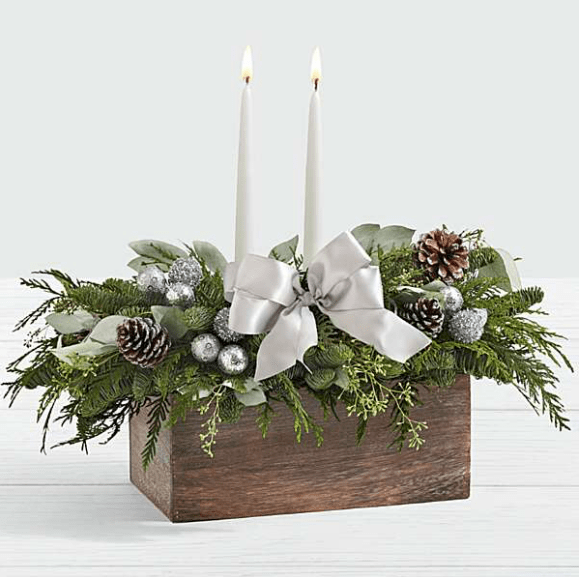 Designed in a rustic wooden container with a pine cones and candles in the center. This lasting arrangement will delight throughout the holiday. This lovely centerpiece will bring warmth and charm to your holiday gatherings.